Wait. 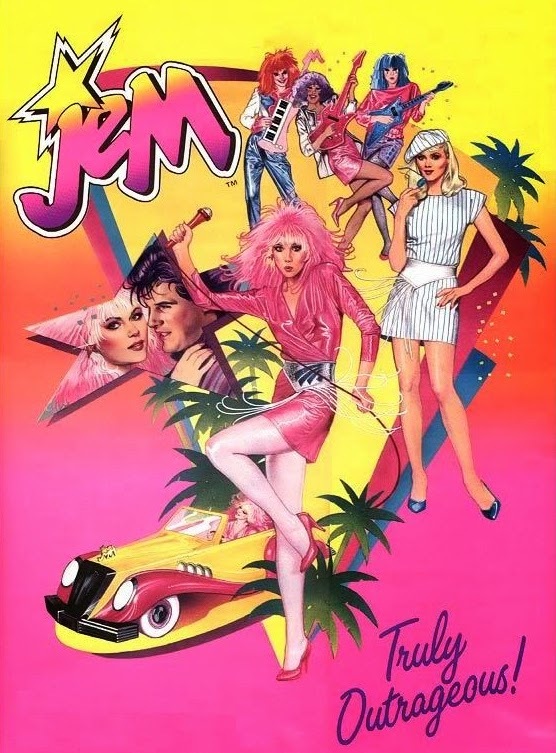 Jem and The Holograms is retro? For Pete's sake! I only finished singing the theme tune on a daily basis yesterday! Now if you are the same, or better yet intune, you might just want to get a vid of your rendition onto Tumblr. Because after the "success" of Glee, High School Musical, American Idol, The Voice, Our Franchise Has Got Talent and 1,001 other shows of similar calibre, movie makers have remembered Jem mixed music and 'cool' back in the 80's, and are bringing her Misfit-outsinging self on to the big screen to show the others how it's done. Directed by G.I. Joe Retaliation's Jon M Chu, glitter, crazy hair colours and fluro gradients are all on stand-by, as fans get to audition to be Holograms. Just remember if you win, you may be a Hologram there, but you'll never be a Hologram here (touches heart). All I know is- just like the cartoon; I'll only watch for The Misfits. Thanks King - is that like 'for the articles?' Yeah the Misfits were better, maybe Josie and The Pussycats needs to step in! Speakin' of songs, I better track down todays Comics Veat!